Most fruits and berries contain quite a lot of carbs. That’s why they taste sweet. They can be seen as nature’s candy. Below is a visual guide. On the left are the best keto choices. Each number represents the percentage of net carbs in 100 grams (3.5 ounces) of each berry.2 So, for example, 100 grams of blueberries (approx 3 handfuls) would have 12 grams net carbs. On a keto diet, small amounts of raspberries, blackberries and strawberries are okay.3 Be careful with blueberries, because their carbs can rapidly add up. Eat only small portions, infrequently, or not at all. 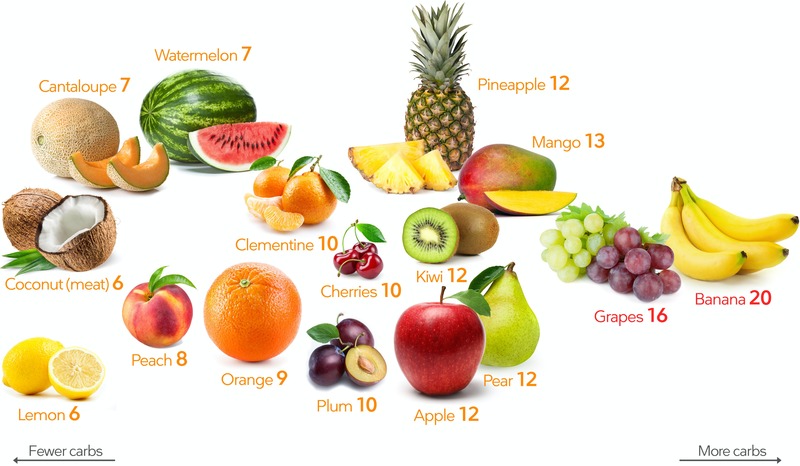 As you can see, other kinds of fruit are fairly high in carbs, making it very challenging to eat them and stay on a keto diet. Again, each number represents the percentage of net carbs in 100 grams (3.5 ounces) of each fruit. One medium size orange is about 12 grams of carbs. If you eat a large apple (about 25 grams of carbs) or a medium-sized banana (24 grams of carbs) you will have exceeded your daily carb limit on a keto diet. On a keto diet you can have some berries every-so-often and it won’t likely take you out of ketosis.4 You might even be able to eat a few cherries or a small plum. Be careful, however, and if in doubt you may want to measure your ketones to assess how fruit impacts you. Raspberries: Half a cup (60 grams) contains 3 grams of carbs. Blackberries: Half a cup (70 grams) contains 4 grams of carbs. Strawberries: Eight medium-sized (100 grams) contains 6 grams of carbs. Plum: One medium-sized (65 grams) contains 7 grams of carbs. Blueberries: Half a cup (75 grams) contains 9 grams of carbs. Even though other fruits are higher in carbs, you can indulge every-so-often. Treat it like candy and eat small portions. Here are examples of the carb amounts of other fruit. Kiwi: One medium size (70 grams), contains 8 grams of carbs. Cherries: Half a cup (75 grams) contains 8 grams of carbs. Clementine: One medium size (75 grams) contains 9 grams of carbs. Cantaloupe: One cup (160 grams) contains 11 grams of carbs. Peach: One medium size (150 grams) contains 13 grams of carbs. Many people ask: “Isn’t eating fruit very natural from an evolutionary perspective?” But modern fruit is very different from the fruits of the past. Today’s fruit has been selectively bred to maximize yield and increase sweetness, thus increasing the sugar and carb content. Here are some of our best keto recipes for berries, with the lowest amount of carbs per serving. New study: Can eating too much fruit cause diabetes? Nutrition facts for oranges, yellow bell peppers, green bell peppers and kale.